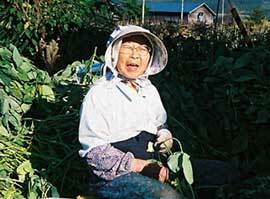 Learn About Japan > Work and Workplaces in Japan > Workplaces > Who Farms in Japanese Farm Households? Year by year, the aging of farmers continues. Photo Courtesy of Japan Zone. In 2001, just over ten million people lived in 3 million farm households in Japan, about half the number there were in 1980. Slightly more women than men live on farms. The number of households that farm commerically in Japan has dropped by one-third since 1985. The drop is most severe for the smallest farms, while the number of farms with more than two hectares (five acres) of land has remained stable. The size of each household has also decreased dramatically. An average of 3.3 people lived in each farm household in 2001, compared to 4.6 in 1980. Only one in five people in farm households do farm work as their fulltime occupation. Some are children or elderly people who do not work, while other adults work at non-farm jobs instead of or in addition to farming. Click on CHARTS below for more information about who farms in Japanese farm households.